Today marks the 43rd anniversary of Roe v Wade, the monumental decision by the United States Supreme Court to declare state laws prohibiting abortion unconstitutional. I had hoped to participate in this year’s March for Life in Washington, DC, but the emergency weather conditions shut down the charter buses scheduled to transport our group to the Capital. Perhaps that’s a seeming victory to pro-choice politicians in Washington who would like nothing more than to see our voices silenced, but the 2016 March for Life wasn’t going to be deterred by adverse weather conditions. 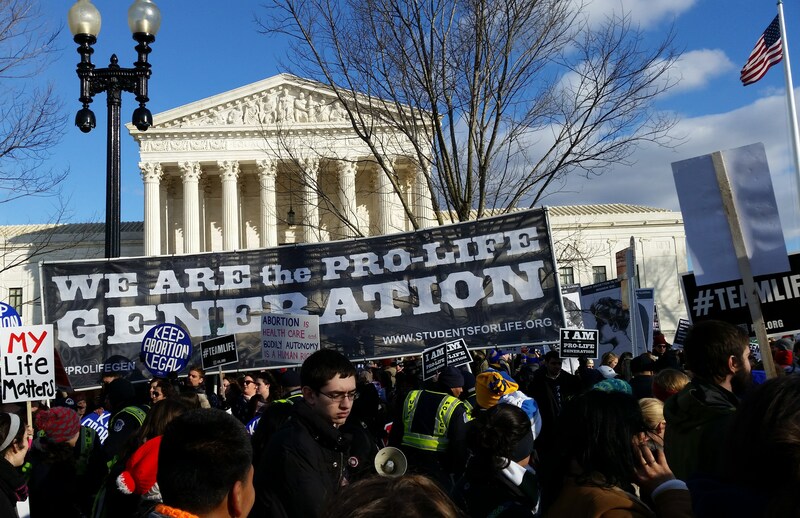 Through snow, rain and freezing temperatures, hundreds of thousands of people from across the country and from around the world have shown up to this event year after year, and the 2016 March for Life was no exception. Although I wasn’t among them, our church still had over 18 representatives brave the weather and make the trek in their own vehicles, participating in this call-to-action and shedding light on a dark topic. It’s our hope and prayer that someday unborn children will be protected under the law. So why is it so important that we address this issue and take a stand for life? I think there are many answers. For one, the right to life impacts all of us. Human beings innately desire life and liberty, and none of us want to be oppressed, mistreated, persecuted, or put to death unjustly. To that end, there is nothing just about terminating the life of a whole group of people who are the most helpless and vulnerable among us. These young people deserve to have a voice defending them so they may experience life to the fullest. that all men are created equal, and that they are endowed by their Creator with certain unalienable Rights, that among these are Life, Liberty and the pursuit of Happiness. -That to secure these rights, Governments are instituted among Men, deriving their just powers from the consent of the governed, – That whenever any Form of Government becomes destructive of these ends, it is the Right of the People to alter or abolish it, and to institute new Government, laying its foundation on such principles and organizing its powers in such form, as to them shall seem most likely to effect their Safety and Happiness. If we respect the Declaration of Independence, then these rights belong to everyone who has been conceived, and the government has a responsibility to protect those rights. I’ve heard all the arguments supporting the pro-choice argument, but I don’t find many of them compelling because there are compassionate ways to help both a mother and child in the midst of a genuine crisis. And to that end I’m thankful for the crisis pregnancy centers across the land aiding women who’ve had abortions, and those contemplating having an abortion. The people who work for these pro-life agencies are compassionate and caring, working to bring healing to those who’ve had an abortion, and counsel those seeking. The women (and men) who work at these places are real heroes, and I admire them for what they do. In closing, let me link to two pro-life pieces- one written by Dr. Grazie Pozo Christie who says to be pro-life is to be pro-woman, and an interview by ex-Cosmopolitan reporter, Sue Ellen Browder, as she discusses how and why she changed from pro-choice to pro-life.